A major aim of SurPRISE was to identify factors which contribute to the shaping of security technologies as effective, non-privacy-infringing and socially legitimate security devices. In particular, SurPRISE paid attention to the way in which the problem-solution framework is constructed and re-constructed over time by the lay public. Deliverables are the official project results, which are distributed to the European Commission. The public deliverables are covered in the dissemination section. Map key security challenges and related security policies and technologies. Identify factors influencing acceptability and acceptance of these security technologies. Identify technical design and legal/regulatory options and non-technical alternatives. Develop models and hypotheses about relationships between privacy and security. Select cases for empirical testing and perform a large scale participatory empirical testing of models. Synthesize empirical findings with theoretical models and practical options to design security solutions. Transform results into smaller scale participatory methods to identify factors of acceptability and acceptance for decision support on security technologies. The work of SurPRISE was organised in eight technical work packages. 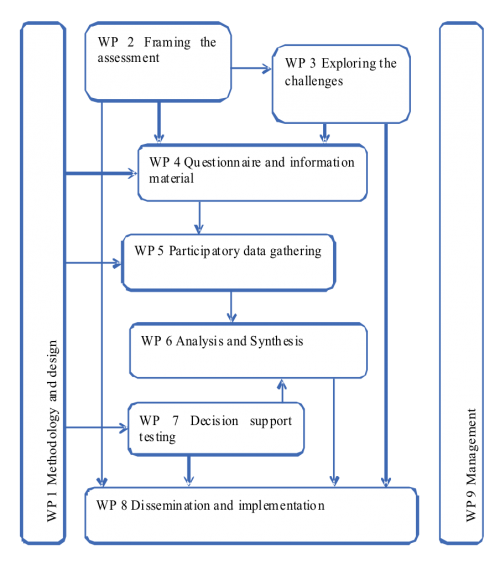 WP1 supported research activities by developing and establishing common project methodologies. WP2 developed a theoretical framing of criteria and factors influencing the acceptance and acceptability of security technologies, which was evaluated and tested in the empirical work done later in the project. Following this theoretical framing, WP3 identified and elaborated on options to shape security measures, to comply with ethical and privacy requirements from a technical, legal and social perspective. Combining the results of WP2 and WP3, WP4 developed an empirical model, which was applied and tested in large-scale participatory activities. WP4 also provided supporting material for the involvement of citizens, including comprehensive information brochures to allow for informed debates and video clips to present a range of conflicting opinions from experts. WP5 organised and conducted large-scale participatory technology assessment events in nine European countries. These “Citizen Summits” involved on average about 200 citizens per country. These citizen summits were full day events, with alternating phases wherein participants received information, discussed the topics and emerging issues in small groups of six to eight persons and voted electronically as individuals on general aspects of the relation between surveillance and security and on specific surveillance technologies. As concluding activity each of the small groups of citizens was asked to develop and formulate recommendations to policymakers. In WP6, the qualitative and quantitative data from the citizen summits were analysed in depth, and synthesised to form conclusions and develop recommendations, combining expert knowledge and citizens perspectives. The methodological approach and results from the citizen summits were also used in WP7 to develop a decision support system, allowing the involvement of citizens in decision-making on security measures and technologies in small-scale participatory events. This approach, called “Citizen Meetings”, was also tested in five countries and the results were integrated into the analytical work and the development of policy recommendations.